Published: Feb. 27, 2013 at 12:04 p.m. Updated: Feb. 28, 2013 at 01:10 a.m. There aren't any truly great options at quarterback in the 2013 NFL Draft. Free agency is even more barren. That leaves a quarterback-desperate team like the Kansas City Chiefs more than ready to lock down their quarterback for 2013 right now. Take a look at photos of Alex Smith through the years. 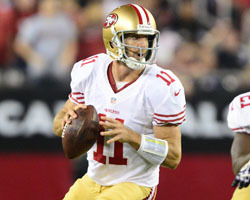 Fox Sports insider and NFL Network contributor Jay Glazer reported that the Kansas City Chiefs and San Francisco 49ers have agreed upon a trade that will send Alex Smith to the Chiefs. The deal can't be official until the league year starts on March 12, but the Chiefs have made a "clear commitment" to Smith, according to Glazer. NFL.com's Ian Rapoport reported the compensation is a second-round draft pick in 2013 and a conditional draft pick in 2014. Glazer's wording suggests that a new contract could be coming for Smith, who was due $7.5 million in the final year of his deal. The Chiefs wouldn't give up this much in the draft for a one-year rental. Glazer said on NFL Network that the Chiefs believe they have their quarterback for the next "several" years. Reid is very high on Smith and the trade terms prove it. Incumbent quarterback Matt Cassel, once acquired in a similar deal by former GM Scott Pioli, is expected to be released by the Chiefs any day now. New GM John Dorsey and coach Andy Reid are starting over from scratch at the quarterback position, with Smith the first big piece in place. Don't be surprised if they add another quarterback through the draft, but this trade is an admission that no rookie quarterback was ready to start right away. With his smarts and his underrated mobility, Smith makes a lot of sense as an Andy Reid-style quarterback. He can help the Chiefs compete right away because the team has talent on defense and some pieces in place offensively like Jamaal Charles, Jon Baldwin and possibly Dwayne Bowe, who sounds likely to get the franchise tag. The downside for Smith: He doesn't have Jim Harbaugh to guide him anymore. Smith had a ton of ups and downs in San Francisco. Now he gets what he wanted most: A fresh start and an organization that truly wants him.